Advanced ID Creator Professional - Create and print professional ID cards and badges instantly! Software piracy is theft, Using a Advanced ID Creator crack, password, serial number, registration code or key generator that has not been purchased is illegal and will prevent future development of Advanced ID Creator. It is forbidden to share any crack, patches, serial numbers or keygen for Advanced ID Creator, or link to pages that contain them. If you do, your user account will be deleted, your IP address logged and legal action will be taken. What's New: - ID Card Design and Print; - Free ID Card Templates; - Barcode; - Network version; - Central database. This download (AID_Professional_Setup.exe) was tested thoroughly and was found 100% clean. Click "Report Spyware" link on the top if you found this software contains any form of malware, including but not limited to: spyware, viruses, trojans and backdoors. 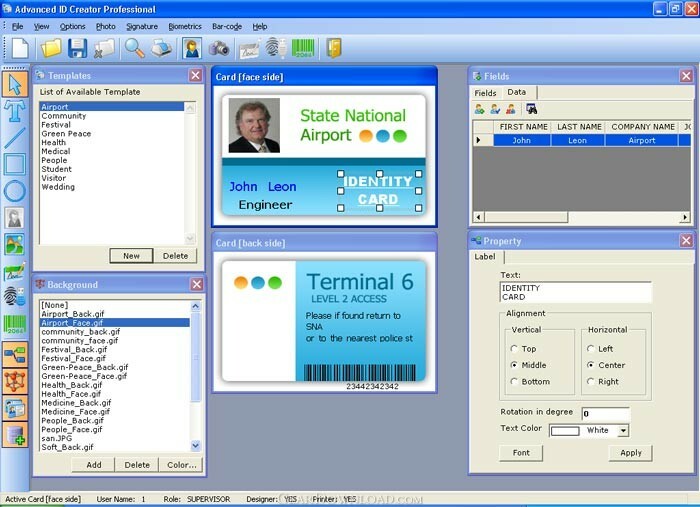 Advanced ID Creator Premier 10.5.276 - Create and print professional ID cards and badges instantly! Advanced ID Creator Personal 10.5.276 - Create and print professional ID cards and badges instantly! Advanced ID Creator Enterprise 10.5.276 - Create and print professional ID cards and badges instantly!